In connection with the editing of our latest O-Sensei video “Divine Techniques” I happened upon an interesting discovery of a technical nature. One of the most important and original techniques of aikido is iriminage. I won’t attempt to describe the entire technique in words since practitioners will immediately know the one I am referring to. To isolate a particular point of interest in iriminage, I would like to show you a picture where O-Sensei can be clearly shown grabbing his partner’s collar in preparation for the throw. It is actually unusual to see it done this way in modern aikido. The collar grab contrasts with the way the opponent’s head is controled in most approaches to iriminage where instead the hand is hooked around to the opposite side of the opponent’s neck or ear. Aikido Founder Morihei Ueshiba executing a setup to iriminage that is very different and does not reveal the vulnerabilities mentioned in this analysis. Holding your partner’s neck really requires you to bring your partner’s head against your shoulder if you want to maintain good control. If your hand is hooked around your partner’s head and his body is away from you it’s very hard to achieve this. 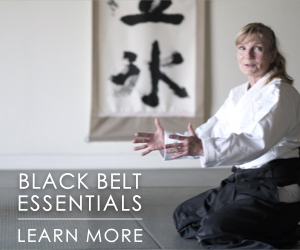 O-Sensei’s approach allows control whether your partner is close or far away. The opponent also will have difficulty twisting out of the technique when held by his collar while it’s fairly easy to do so when the head is grabbed on one side by the hand. We seldom discuss the specifics of the Founder’s way of doing particular techniques probably because information and visual references are scarce. Most of what has been preserved of O-Sensei’s techniques is in the form of 8mm films which tend to be grainy making it hard to pick out details. Since this point is so clear in “Divine Techniques,” I thought I would bring it up for discussion. I would like to encourage readers to chime in on this important technical point and tell us how you were taught to do iriminage. What do you think of this photo of O-Sensei’s iriminage? Grabing collar or head is essential in iriminage technique. That’s the only effective way to unbalance and take control the opponent before the throw, it’s almost impossible to do iriminage in a realistic situation if one does not do so. By the way it is exactly how Saito sensei would teach this technique. I don’t believe that O Sensei did any techniques the same way very often. It was, as far as I know, his son who began the process of standardizing and naming techniques. I understand the pedagogics of insisting upon a “right” way to execute waza, beginners need to learn something, but in reality that is simply not the case. I teach irimi nage with collar hold, neck hold, shoulder touch, cheek or head control, carotid artery pressure, no back of neck at all, just shomen ate, all according to uke’s build. speed angle of entry, timing and above all, the problem of “what actually happens at the moment”, the continuous quest for takemusu aiki. I have also seen a photo of O Sensei entering irimi nage and delivering two simultaneous atemi, one to face and the other to the floating ribs. Is that also his technique, I believe so. There are also quite a number of pictures of O Sensei doing irimi nage without grabbing the collar of uke. It is rarely a good idea to make a rule from a single picture, is it ? It’s not at all clear from that picture that O’Sensei is grabbing the collar. He clearly has his hand on the collar, but it appears to me that he is grabbing the neck. Perhaps grabbing is the wrong word, however. b) his shirt may be loose, affording no control. I very much appreciate Mr. Corper’s open-minded comments. Iriminage is a principle, which can, has been and (hopefully) will continue to be applied in many ways. That said, it is also important, as Mr. Corper also pointed out, to have a basic waza through which the student can endeavor to discover underlying fundamental principles. Ideally such principles should transcend any one standard technique or fixed interpretation. Please note that grabbing of the collar in iriminage is not actually so unusual in ‘modern aikido’: in Yoshinkai kihon waza the technique is almost always practiced this way. Interesting comments from all. I have added a second photo of O-Sensei holding the collar in iriminage for reference. A couple of thoughts come to mind. If the proper way of doing iriminage changes according to one’s uke and the situation then perhaps there really is no “basic” way of doing it. One commenter points out that practitioners of Yoshinkan Aikido perform iriminage by grabbing their partner’s collar. The Founder of Yoshinkan Aikido, Gozo Shioda Sensei, studied under O-Sensei from 1932-1941 and for a short time soon after the war in Iwama. 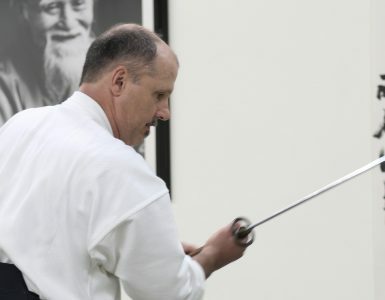 Another gentleman–a practitioner of Iwama Aikido–mentions that Morihiro Saito Sensei executes iriminage that way. Saito Sensei studied with O-Sensei in Iwama beginning in 1946 through the Founder’s passing in 1969. I still hold that this type of collar-grab iriminage is NOT common in modern-day aikido. If you were to attend an All-Japan Aikido Demonstration, you could watch all day and only perhaps see this way of doing from someone with an Iwama Aikido background. This Aikikai Hombu event is huge with more than 5,000 demonstrators appearing. 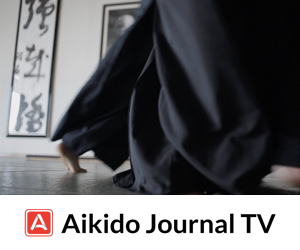 The Aikikai is by far the largest aikido organization representing 80% or more of the world’s practitioners. Neither Kisshomaru Ueshiba Sensei nor Koichi Tohei Sensei grabbed the collar when doing this technique as far as I can remember. These two are the most important disseminators of aikido in the postwar era. So we’re left with the following connundrum: Was this way of grabbing the collar by O-Sensei just an example of how he did the technique on certain occasions? Did the Founder actually not have a “basic” way of doing the technique but rather a “principle” for doing it? Why do the Yoshinkan and Iwama fold do it that way? Finally, someone mentioned that that are many photos of O-Sensei doing iriminage differently. If you would kindly forward such examples to me I will gladly add them to expand the discussion of aikido’s iriminage. There are many photos and videos of O-Sensei doing iriminage without grabbing the collar. In his later years, it appears he was merely touching the side of uke’s neck or head. Saito and Shioda aren’t the only ones, see Endo Seishiro of the Aiki-kai. I am not sure if the word ‘basic’ or ‘proper’ applies to aikido, which, taken as a whole, is such a diverse art. I think what is ‘basic’ is only basic for pedagogical purposes. And every instructor is more or less free to make up their own distinctions basic, intermediate, advanced, as they please. The only reason you’d want to have basic is if you had people without a martial background and wanted to give them some forms to work on. Basic or not, everything IMO in aikido is either something that works within certain parameters or doesn’t. There is little point in repeating so called “basic movements” that have no meaning but I do conceded the fact that that is unfortunately what most aikidoka the world over do. Sadly. First, I was taught that as part of Saito Sensei’s system. There’s more to it than that, though, a lot more. More than I have time to write about at the moment. The problem, from the standpoint of playing in the park, is that there isn’t a judo gi collar to hold. That doesn’t mean that nage can’t grab the base of the skull, however, on both sides of the spinal cord there are “finger holes”, not quite like a bowling ball, but…;-) And that leads to the more complicated part which I beg off on for the moment. What is really fun, though, is that I found a Greco-Roman wrestling irimi nage a few years ago. Executed from kneeling it’s only slightly, but significantly, different from ours. I have lately been in a mode of comparing my Aikido training, learning and application to that of my Career in music. I have been a professional musician for about 25 years. I never ever play the same music the same way…EVER!!! I can play the same song in various different ways. More Jazzy, more funky, more classically…etc. In music the basics are soo instilled in me that I can have mastery over a piece at will. So the music is translated out of me, moment by moment based on how I am feeling at that moment. 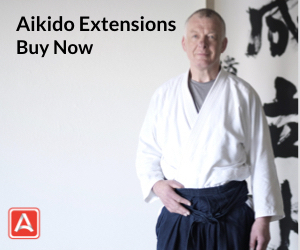 Aikido should not be any different. I think this is true mastery, To know your craft so well, that you can without thought do the same thing (piece or technique) different ways flawlessly. Our sensei notes that irimi nage can be done in various ways, but the standard way he teaches is indeed a ‘collar grab’. The hand grasps the collar and the forearm rests firmly along the spine of the partner. This way, one only has to slightly twist the hips to unbalance the partner effectively. About the comment on the opponent wearing a loose shirt. While I agree that is true, it’s equally the case that an opponent may twist out of an irimi nage, or escape from shiho nage. Are we training to execute a technique faithfully, or are we training ourselves in Aikido? I often think about that. I have been taught many ways to perform techniques and also the basic way. There is no one defined way to perform any technique but in saying this it is crucial that there is a good solid point of reference. This is where “the basics” come into play. Once the basic principles of any technique have been engrained in the student it easy to determine if variations work or not, especially if there is honesty in form from both uke and tori (this is the main ingredient of combat).What I mean is by exhausting all possible variables in attacking and committing honestly, uke gives tori the opportunity to test the principles and their value. Iriminage is no different, depending on the attack and the successful reaction to the attack which could be by blending, leading or the direct method. They all have one thing in common in being successful which is breaking the balance of uke. This can be achieved by taking the neck, body, gi, shoulder, face, skin (shirtless) or an arm. The body part you use or don’t use means nothing if you don’t break the centre and take uke’s balance. O sensei was a true master of using what was given to him in any moment of time. Good timing, solid basics, quickness of mind and a good technician among other variables that I don’t have the time or the all knowing knowledge to go into is what makes any technique work. All methods that work are correct (and one should steal these at every given opportunity) it’s just that there are so many variations that do work. Which is good thing as one should be opened to other ways otherwise the techniques become stale or easily countered. We are all still learning this system and aikido is always evolving but the basic principles remain the same regardless of the small differences in the variations. That’s what makes it fresh no matter how many ways the technique is exhausted. O sensei conditioned his mind and body this way as nobody will ever know what way they are going to be attacked or how anybody will counter the attack in any given situation. Best to treat every attack as an entirely new challenge if not there is the danger of defeating oneself. I for one think that this is the approach O sensei took, a new approach with the same underlying principles in mind. 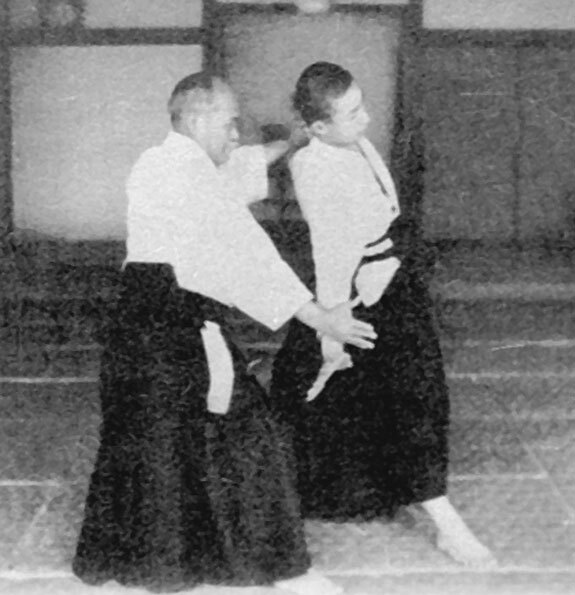 Stan, in addition to Shioda performing Iriminage using a collar grip, another of O’Sensei’s direct students, Renjiro Shirata, also employs the collar grip in his “basic” Iriminage (See AIKIDO THE WAY OF HARMONY, page 92). Similarly, Kisshomaru Ueshiba in AIKIDO describes Iriminage, using the collar grip, in the section titled “Basic Techniques” (See AIKIDO, page 48). Later, in AIKIDO, Kisshomaru Ueshiba, in the section titled “Applied Techniques,” he describes using the rear hand (collar hand in the version described in the “Basic Techniques”) to grasp uke’s neck in some and to push uke’s neck in other versions of the technique. Kisshomaru Ueshiba apparently continued to demonstrate the collar grip as the “basic” method, as clearly demonstrated in the section “Irimi-nage Fundamental Techniques” in THE ART OF AIKIDO, PRINCIPLES AND ESSENTIAL TECHNIQUES (published in 1986). In that text, he used the collar grip in demonstrating Irimi nage in response to a Shomen Uchi attack. In the same section of the book, Moriteru Ueshiba demonstrates the same technique grasping the neck. There are photographs of nearly all of the above listed individuals, including O’Sensei, performing Irimi nage using other than a collar grip. I think your observations and these additional examples makes for a very defensible argument the collar grip is the “basic” method of O’Sensei’s Irimi nage, with the other being applied variations. Regards, JED. I have for many years practiced (mostly within the United States Aikido Federation) iriminage without a collar grab as the basic method, but I have often seen it as a variation. This basic method also involves a tenkan opening followed by the actual throw. When I have seen the collar grab variation, it is most frequently done with a more direct irimi without much turn. 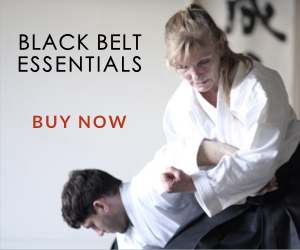 With the tenkan, there is an emphasis on unbalancing by pushing on the back of the neck. It seems to me that taking time to grab before this pushing action would make it more difficult to get the timing right. The difference between those that emphasize grabbing the collar and those that don’t seems to be whether the tenkan movement is part of the basic version of the technique or not. Saito Sensei’s method, as well as O-Sensei’s method in many photographs, is to preform iriminage without the tenkan opening with a collar grab. There are also many films of O-Sensei demonstrating “no touch” iriminage, but perhaps that is a different topic. I have also seen several teachers show “one-handed” versions of iriminage as a teaching tool. This usually involves throwing with just the arm across the neck (I’m simplifying) and then with just the hand at the collar. When done one handed, there is invariably a collar grab as the technique doesn’t work without it. Most of the pictures of O sensei doing irimi nage he doesn’t grab the collar of uke but hey thats just my opinion. There are many Irimi Nage Waza. Ive seen all sorts. My Sensei, Sensei Sam Combes never taught to hold the head to the chest. He didnt think it was very practicle. Of course, our style, Yoshinkan/Yoshinkai isnt Aikikai. Many of the films that I watch are mostly Aikikai style. Christian Tissier’s Irimi Nage looks very good. Steven Seagal’s Irimi Nage is like a clothesline, but Seagal likes to go straight thru rather than around it looks from most of his demonstrations and not moving uke around. I use my chest to get Uke to move rather than placing my hand on the neck. Yes I DO place my hand on Uke’s collar bone, but not his neck. As I turn my hips, I make sure Uke’s arm is accross my chest and Uke’s palm is facing away from me. This makes the elbow weak and I can get Uke to dance around 360 degree’s pretty easy. I will press on Uke’s collar bone so that he may resist, and his flow of energy will then be going against me, then bam…Irimi Nage. I go with him, not against him. Which I suppose is Aiki Isnt it ? 🙂 I could place the hand on the neck. For Me I dont know if it would matter since im not using that hand to turn Uke anyways. Getting Uke to move is important. In irimi nage it is essential to know how to enter first. You have to enter deeply but this entering will depend on: the attack you suffer, it will depend on your partner’s strength, physic and espiritual force (intention) and on your own physic and physical condition. The advantage of grabbing the collar is not because it is the collar per se(though this is important) but mostly because it is the center line of your attacker. By controling the center line you can control both the left and the right side (most people only concentrate on the unbalancing side of the attacker). Morihiro Saito Sensei often explained this. Sensei also used to say that for a good entering, your stomach had to “see” your attacker’s back. This I wrote down several times in my notes, for every time he said it I always thought it was a very good point and the first time I ever heard it …. If your attacker is bigger than you, your irimi nage will be more round as you have to bring him/her down below the level of your eyes (is is best that your eyes be able to see above your partners head, both for a good vision of what is happening on your back and for applying a reasonable atemi to your attacker’s face). To bring a big attacker down can be done more effectively if you do it in a circular movement. Clearly, in the movies, O’Sensei applies this type of irimi nage with people bigger than him. And yes, for this he has to grab the collar or the neck. This circular movement will also be used in case you have to throw your partner in several directions or on top of other attackers. The circular movement is done after entering to your attacker’s back, of course. However you can only do this circular irimi if you learn the basic way (and the most useful tto) which is to enter deeply and to throw your partner in the direction of your entering. This, I believe, we should practice 99% of the time. Because this technique involves so many interesting “secrets”, such as the bases for ninja no waza, I often wondered why O’Sensei taught it openly. Obviously, it did not hurt too much the “secret” purposes of irimi nage as no one really studies the depth of this fantastic technique. If we study the movies and pictures of O’Sensei it seems to me that sometimes, when he was in some type of playfull mood (or maybe depending on who was watching) O’Sensei would often change all techniques. The way his uke reacted, too, did often influence the outcome of the technique. Don´t you agree? Even so, at these times, we cannot just to look one specific part of the body of this incridible budouka when he applies a specific technique; we have to look at the whole of his body, his hanmi, his shoulders, his look…etc. John Driscoll has pegged it again. I’m concerned about the use of the term collar “grab.” From my perspective placing the hand and hooking or grabbing the neck/collar/collarbone area makes the presence of any clothing irrelevant, and practitioners shouldn’t be misled into thinking that they should be grabbing cloth. As an interesting aside, I find Nishio Sensei’s method to be the best to prevent uke from escaping or reversing the technique by turning inside or toward the nage. He would put his hand more on the side of the head, which makes the hold more comfortable for nage when he clamps uke’s head firmly to nage’s shoulder/upper arm. Once the head is clamped there and the throwing arm is in motion, an attempt by the uke to turn in would only result in wrenching his own neck. This can be unpleasant surprise for an uke trained in advanced Aikikai-style ukemi, where you turn inside toward the uke to do a forward break fall and keep open the option of a reversal. If you are in a dojo where the throw allows uke to turn and take over the fall, you might want to warn him/her if you are going to be hanging onto their head for longer than usual. All I have access to at the moment is YouTube. Looking at various clips of Ueshiba, it’s very, very clear that his post war technique was to either grab the neck or the gi near the neck. And the clips of students practicing also show them either grabbing the neck or the gi near the neck. Only in one instance did I see Ueshiba using side neck/head control. But, I also saw an instance of Ueshiba grabbing the gi near uke’s shoulder, so variations were done. 99% of what I saw was as Stan wrote above. Thanks for pointing that out, Stan. Uh .. maybe this is obvious .. but who studies pressure points of the human body and the relation of aikido techniques to the use of known pressure points found in an acupuncture chart? Some techniques are modified because they are too dangerously close to being activated accidently by students during training sessions, which in the case of a knock-out to someone with a pre-existing medical condition .. could mean death, believe it or not. So, just don’t take a change in the way a technique is performed as a simple variation, which it is on one level of application or thought, but search for the deeper meaning of its application that we avoid for safe practice. Study the charts … the meridians .. and it becomes clear why some things are changed. What .. you never saw someone accidentally knocked unconscious in class? Somebody in that school had better learn the revival techniques …. ya think? 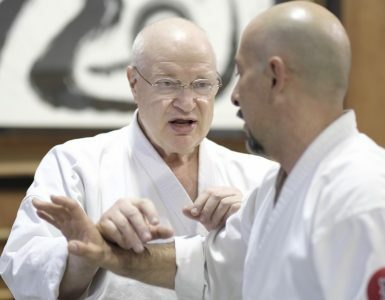 I began training with Seiichi Sugano when he arrived in Australia in 1965, and the neck grip shown in your column is precisely the way he taught then and the way I’ve been doing and teaching it for 45 years. Since then I have focussed all my energy on discovering what he meant, and I am grateful to him beyond words for pointing me in this direction. 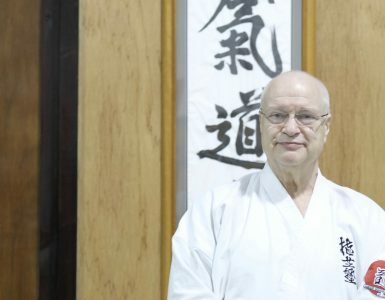 Clearly there is no room here to discuss this fuly, but those who seek to follow this path will find it helpful to seek to truly understand what O’Sensei meant when he said he could only really explain Aikido through the triangle, the circle and the square. To understand the circle we need to do the kokyu-ho exercises which, over time, attune us to the true nature of circularity, which in turn helps us understand the Void created by correctly circular tai-sabaki. To understand the triangle we have to practice hanmi, especially with weapons. To put the triangle and circle together so the full powers of irimi are created through correct tai-sabaki, we must study the movements of wind and water. There is a short film clip of this titled “The Vortex” on my web page http://www.aikido.net.au and some articles which may help. Another point from your column is that Sugano Sensei taught that there are three atemis with every basic technique, and that some techniques involve two atemis being made simultaneously – double strikes. Skilled opponents may successfully block one of these, but it is impossible to block both at the same time. A final point about irimi-nage is that holding the neck enables tori to pour ki directly into the spinal column – the “Governor Channel” of Chinese medicine, in such a way that uke’s body can be directed in whatever direction one wants. I absolutely agree with Stanley Pranin. I think if nage grabs the collar of uke, he can control uke better. We can see Iriminages done by that way, in the videoclip “The best of 48th all Japan Aikido Demonstration (2010) http://www.youtube.com/watch?v=PbaH7xmtkgg. At minute 3:34, nage grabbed uke’s collar, and he did tenkan many many rounds. I think it’s possible! This mean that we have to consider to cases. One is the teaching. For this purpose the teacher has to present a ‘classical’ and basic move. This is the way in any sport. Second ; as practice and mastering improve Teacher may present differents approachs. Third, in real situation You probably can’t control all parameters. So far, I guess that’s the very reason O’ Senseï present this peculiar way. Cause in real situation there is one GOLD rule : NO RULE !